5-7 July NZSA/CNZS conference in Florence, Italy, keynote presentation ‘Talking to the Future in the Mountains of the Star’ and presentation with Brian Flaherty of nzepc’s LOVE, WAR AND LAST THINGS: A Digital Bridge for Florence. 18 July Poetry Central at Auckland City Library, launching New NZ Poets in Performance and Bob Orr’s Calypso on Montana Poetry Day. 4 August Hand to Hand: Five Laureates at Writers on Mondays, reading with Jenny Bornholdt, Bill Manhire, Elizabeth Smither and Brian Turner at the National Library, Wellington. 13 August Chancellor’s Lecture ‘Resuming folding life’ at Massey University, Albany campus. 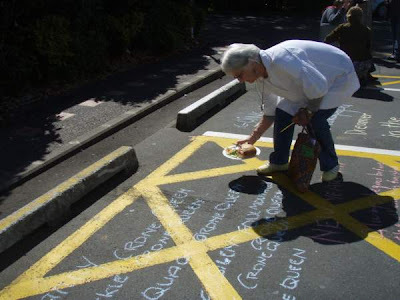 28 August Mollie: On the Track of the Ohakune Elephant 1957-2008, University of Auckland. 5-7 September The Press Christchurch Writers Festival, panel discussion with Bill Manhire, Bernadette Hall and Brian Turner. 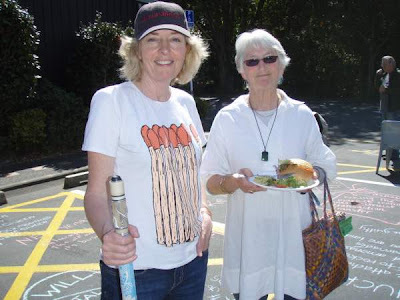 20 September Poetry off the Page, presentation with Helen Sword at Going West literary festival in Titirangi. Top: With Penny ('Crone Queen') Somervaille.